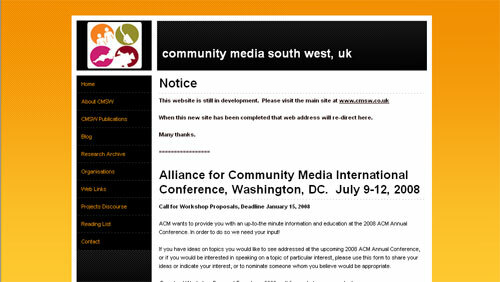 Interesting videos on a community media organisation from Chicago. What is Street-Level Youth Media? Yesterday morning I received a reply from my local MP regarding a campaign to get MP’s to sign the early day motion on ring-fencing a channel on Freeview for local/community programming, anticipating the digital switch over. With her response she enclosed a letter from the DCMS regarding my request. I don’t know if the DCMS letter is a standard one that they send out to everyone. It’s one and a half sides of A4, but the last paragraph sums it up totally. I found it perversely reassuring to see the battle lines so clearly laid out in black & white. Thanks a bunch Andy for making that so clear. Basically what the DCMS are saying is that a community tv station will have to bid for a channel alongside other commercial bidders such as shopping channels and music stations. When the digital switchover happens local programming will pretty much disappear, except maybe for news. BBC, ITV, C4 and C5 are already saying that come the switch over they will be an unfair disadvantage as none of the other digital channel have to have a public service remit. ITV are already backing away from confirming they will continue their public service agenda. Without the DCMS and Ofcom supporting community and local programming by ringfencing a channel on Freeview, the fight for community television broadcasting will be over. Costs to run a digital channel are hugely expensive and competing against commercial stations will be near impossible. The Community Channel would be the obvious answer, but unfortunately that channel is a huge missed opportunity and nothing but an advert channel for charities. The DCMS and Ofcom are saying that the future of local and community programming lies in broadband, which is unfortunately missing the point as for much of the target audience for local community programming, (i.e. the elderly, those disenfranchised, etc), many will be on the wrong side of the digital divide, and won’t have computers let alone broadband access at home. If you are passionate about the future of local and community television then visit the campaign at the Community Media Association (CMA) and ask you local MP to sign the early days motion. Full text for communication to your MP can be found at the site.